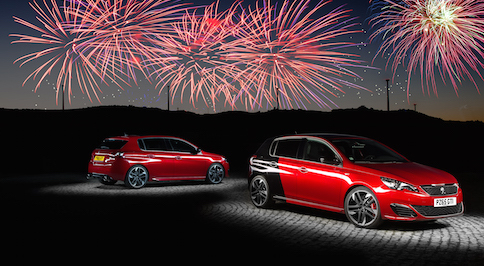 On 5th November, the hotly anticipated Peugeot 308 GTi will begin to be delivered to its new owners, whilst the car's full specifications have been revealed. Signifying the return of the iconic Peugeot GTi badge to the medium car segment, the new model builds on the momentum created by the well-received 208 GTi. The 308 GTi has been developed by Peugeot Sport, the French firm's in-house motorsport division, from which seasoned engineers can impart their vast technical ability on road legal models. The new hatch is the fourth project in three years for Peugeot Sport, following the RCZ R, 208 GTi 30th and 208 GTi. The esteemed GTi badge only features on Peugeot products with the highest performance. An acronym of Grand Tourer Injection, the title has become synonymous with hot hatches, with which Peugeot has played a significant part, thanks to the 205 and 309 GTi's. It is these classic models that the 308 is aiming to emulate. To this end, Peugeot have given the 308 GTi a subtly sporting exterior, complete with twin exhausts and black diffuser, whilst the cabin is clearly sporting-orientated. The new 308 flagship is powered by Peugeot's latest 1.6-Litre THP petrol engine, available in two power outputs  250hp and 270hp. Both ensure the GTi hits 62mph in 6.2secs, and reaching a 155mph top speed. Thanks to Stop&Start technology, however, the official Combined Cycle is 47mpg. Peugeot Sport have given the 308 GTi an impressive power-to-weight ratio, with the 270 achieving 4.46kg/hp, a new segment record.